I have a unique Vogel crystal for sale, made by one of his cutters. It is of the Star of David design. If you are interested, go here. My friend Irwin, dowser and healer, had three Vogel crystals, made by Marcel Vogel himself. The crystals had quite some energy in them, going by my own feeling. 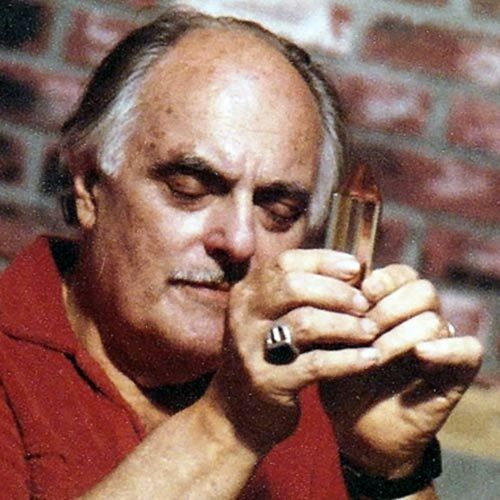 One time, when I was suffering from severe tension in my head, Irwin suggested that he could try to draw out out the tension-energy with one of his Vogel crystals. He used the four sided one, which Marcel Vogel said was good good for treating physical problems. Irwin tuned in to my energy by using the method described by Marcel Vogel: the up and down movement for amplification while tuning to the problem, and the circular movement to make a connection to the energy field of the person, and then to the physical problem. 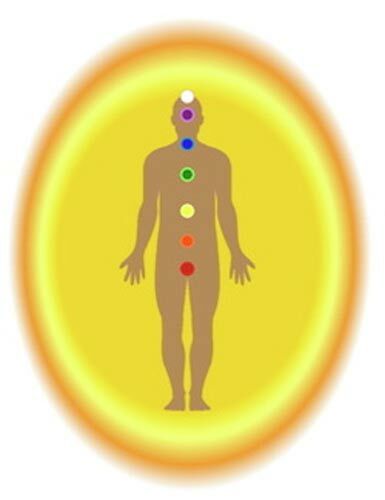 Irwin could feel when he had successfully gained access to the energy field of the body, or aura. I think it is based on making the crystal resonate with the frequency of the aura. He then proceeded to concentrate on the tensions in my head, wanting to draw them out. When he thus moved the crystal back (it was at the left side of my head), I went WOW! I suddenly felt something I had never felt before or since. It was a very clear and definite feeling but it is hard to describe, so I have to resort to descriptive imagery. Imagine that you have an energy field that is substantial, all the way around you, enclosed in an all-encompassing coccoon-enclosure. You have never felt it before, and so you don’t even know it is there. Suddenly you feel both the energy fluid around you in a very substantial feeling, and the coccoon-membrane that holds it all together. You feel membrane being pulled, by the crystal at the level of your head, with the resulting pull of the energy fluid that is moving with the pulled membrane at that location. That is what I was feeling. It was a very particular feeling that I cannot describe, but it was very clear, very strong. Irwin, disconnected the crystal from my aura, because he didn’t know what was going on. He rarely used his Vogel crystals, and he had never encountered this reaction. Once he disconnected I didn’t feel that particular feeling anymore, or ever since. It was proof to me that Vogel crystals are indeed a very particular and useful tool for working with subtle energy. Of course, it all depends on the person who is using them. Aside from other healing methods that can be used with Vogel crystals, a Vogel crystal can indeed access the aura of a person in a very tangible way. It is up to the healer if he can tune into the aura successfully, and if he is knowledgeable enough to cause positive changes in the energy field of a person. A Vogel crystal is not a tool to tinker with, you have to know what you are doing. The following is my opinion about some claims made by USA sellers of Vogel crystals, made in the USA. Marcel Vogel himself was a scientist who got interested in quartz crystals. At first he developed the four sided crystal and the 51º angle of the top point. He experimented with different sizes and numbers of sides and deduced certain properties depending on the number of sides of the crystal. He went around the world, lecturing and giving workshops in which he made it very clear that he had only started a new crystal technology, and that it was up to other people to develop it further. In other words, one should take his words as a guide and not as a doctrine. In his workshops he showed a method of working with the crystals for healing on another person. One can start with this method, but it is more important to develop one’s own way of working with a Vogel crystal. I see people claiming that the 51º angle of the top point is a must. I disagree with that. Any angle will work. The primary requirement is the symmetry of the crystal and the number of sides. Vogel got the 51º angle from existing literature about the angle of side the Great Pyramid of Giza. I researched this thoroughly. Why 51º? I found that many people claim the angle is this or that degree, minutes and seconds. There are several numbers floating around. How can it be that there is so much discrepancy? Well, it turns out that nobody knows what the exact dimensions are of the original construction of the Great Pyramid. The Great Pyramid, as it exists today, has been eroded so much (actually I think the outer shell of the pyramid blew away when the ancients misused its energy) that it is impossible to deduce the original dimension from the present day remains. The dimensions of the Great Pyramid have been measured several times with different results. I also see people tweaking the numbers to fit a preconceived idea they have about the angle. In my opinion the angle is 51º 49. 38” because the cosine of the adjacent over the hypotenuse (or half the base of the Great Pyramid over the side) is 0.6180339… which is the Golden Ratio Conjugate, or 1 over the Golden ratio (1.6180339…). I assume that you are familiar of the importance of the Golden Ratio in the Nature and the universe. However these are all details. The top of a Vogel crystal is only about an inch long, so its angle is not going to be that accurate at all. When you go on the websites of the USA made Vogel crystals, they all reel against the Vogel crystals made in China. Well, I have to say that the China crystals are as perfect and as good of a quality as the USA ones, but a lot cheaper. In my opinion the USA ones are way overpriced. I ordered an (expensive) Vogel crystal from the Rumi Da website, but I had a difficult time with them. I then went on Ebay to check out the Chinese providers of Vogel crystals. I looked around, every day, for a couple of weeks, to get a feel for what was available and from whom. I suggest you do the same. After a while you get the feel of who is a reputable seller, and who has high quality stuff. I looked very carefully at the pictures, enlarging them to check out the veils or inclusions if any, and how well they were cut. Also what feeling they conveyed to me. Based on what I have seen from the Ebay sellers (made in China), and the crystals I have ordered and received, I have to say the ones I have, are superb. They all have very precise cuts, and they are very symmetrical. The quartz is of high purity and their energy is excellent. You also have to pay attention to the dimension of the crystal. For my hand, I find the size of 4 1/2” to 5” long and 1 1/4” in diameter ideal. That way I can rotate the crystal freely. Larger sizes and diameters are more difficult, and my fingers get tired quickly. But you don’t have to rotate the crystal, that is just my preference. I have a larger smokey Vogel crystal I like very much too. I have several Vogel crystals from China, and I love them all. Marcel Vogel said that veils and the like inside a crystal don’t matter much, but I choose all my Vogel crystals as clear as possible. Vogel also said that a smokey crystal was good for drawing out negative emotions/blocks. In regards to the number of sides of a Vogel crystal: the four sided is for physical work, the six-sided for emotional and the eight-sided for mental work. I feel that the twelve sided relates to cycle of Earth experiences a human can go through on this planet (like the twelve signs of the zodiac). I really like my thirteen sided. This one feels like it is an energy level or plane higher, and relates more to the aether matrix of the physical world, or the unseen energy world ‘behind’ the physical. Marcel Vogel ended up using the thirteen sided for all his work. I also have a thirty-three sided. I feel that this one relates to the cosmos at large. It has a very good feeling, but I am not really ready yet to work on this level. As I said, the China crystals are cut to perfection, symmetric, flat sides, sharp points (which means equal triangular faces of the pointed top). 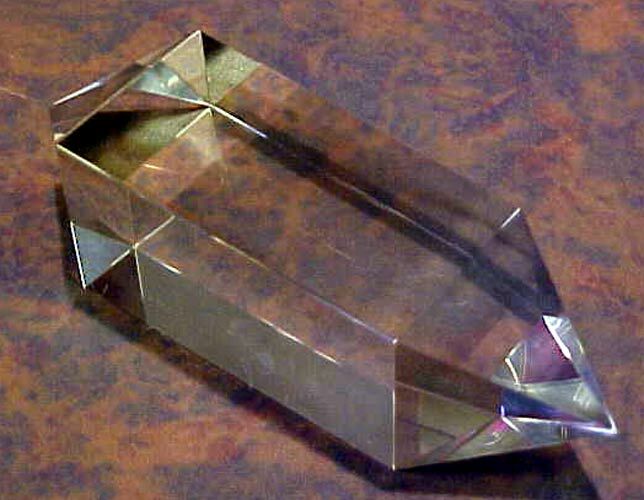 What is little known is that Marcel Vogel himself made his crystals by hand, without a lathe. (A lathe is a machine tool which rotates the workpiece on its axis to perform various operations such as cutting, sanding, knurling, drilling, or deformation, facing, turning, with tools that are applied to the workpiece to create an object which has symmetry about an axis of rotation.) All the crystals he made, and I verified this with the crystals my friend Irwin had, were not perfectly symmetrical, especially the top. When he cut and polished the sides of the slanted top, he always ended up with the tip of the triangles not meeting exactly at the top. Nevertheless his crystals were powerful, and that is, in my opinion, due to the fact that he always tunes into the divine energy and sang the whole time he was making the crystal. Marcel Vogel has gone to the other side of Reality, but you can do that too for yourself when you buy a Vogel crystal, made in the USA, China or Brazil. I have seen Vogel crystals made in Brazil. They typically have much larger (longer), and thus pointier, tips. Personally, I feel that the energy in their crystals is of much higher frequency. However their much larger tip is more vulnerable to accidentally breakage. There is a USA site that sells new versions of Vogel-like crystals. They are large in size, with many facets. Very beautiful, very powerful, but at a price of above a thousand dollars (up to $3000, and even more), you don’t want to accidentally break their point. 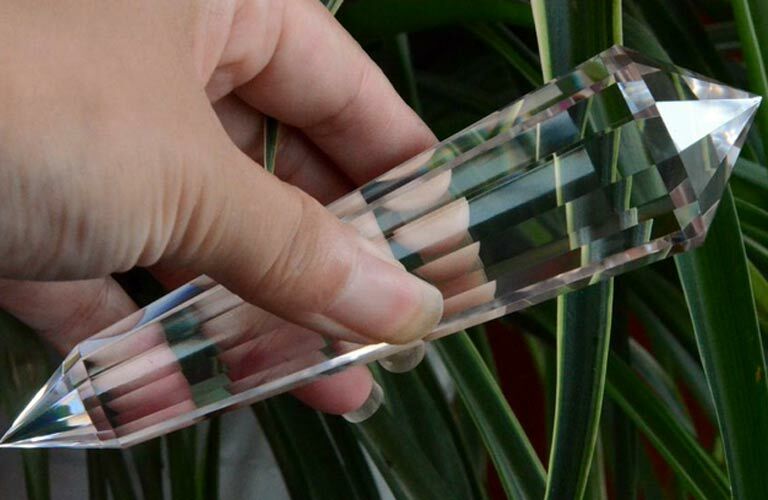 Unless you want to do very advanced and specialized energy work, the made in China Vogel crystals will provide all the needs you have. I don’t know if the USA cutters of Vogel crystals still put such a program into the crystals. I think the Vogel crystals can also be used in the alternative technology that some people use today. I am thinking about certain coils or other aether based devices. I have no experience in this, but the Vogel crystal might amplify whatever the device is used for. Again, be responsible and think ahead of what might happen. Marcel Vogel discovered this too when experimenting. Marcel’s research into the therapeutic application of quartz crystals led him to the investigation of the relationship between crystals and water. He discovered that he could structure water by spinning it around a tuned crystal, altering many of the characteristics of the water and converting it into an information storage system. Although in most cases it was found that water generated a weak magnetic field, on one occasion a different effect was noted. Normally the effects noted above were attained by circulating water through a Pyrex glass tube coiled seven clockwise turns, around a Vogel-crystal. By reversing the position of the crystal so that the firing tip was pointed upwards, an energy was released that lifted Marcel off the floor and flung him to the wall. He was standing approximately three feet away from the apparatus when this happened. Afterwards his eyes were burned as if from intense radiation. Needless to say he did not try that again. So be aware, there is a big potential for discovery and development of this ancient but new to us science of crystals. This entry was posted in Aether Technology, Consciousness, crystals, healing and tagged aura, crystal, energy, energy field, healer, healing, Marcel Vogel, spirituality. spiritual, Vogel crystals. Bookmark the permalink. Thank you for your honesty and research. I enjoyed your blog. Found you by doing a search on crystals.